Ludwigia arcuata is a native of the southeastern US. It is reddish in moderate to strong light . 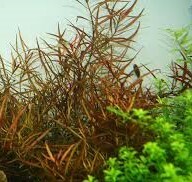 Micronutrients help preserve the reddish coloration which are usually added in sufficient by fish and fish food. It is an excellnt choice for aquariums not equipped with CO2 injection. We ship Monday, Tuesday and some Saturdays as weather in your area permits. We like to have atleast 3 nights above freezing in your area to insure safe shipping.